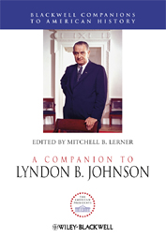 This companion offers an overview of Lyndon B. Johnson's life, presidency, and legacy, as well as a detailed look at the central arguments and scholarly debates from his term in office. Explores the legacy of Johnson and the historical significance of his years as president. Covers the full range of topics, from the social and civil rights reforms of the Great Society to the increased American involvement in Vietnam. Incorporates the dramatic new evidence that has come to light through the release of around 8,000 phone conversations and meetings that Johnson secretly recorded as President.